Helen Louise Beckhorn, age 77, passed away Tuesday, May 15, 2018. She was born in Muskegon, Michigan on January 9, 1941 to Jesse & Henrietta (Nyhoff) Beckhorn. 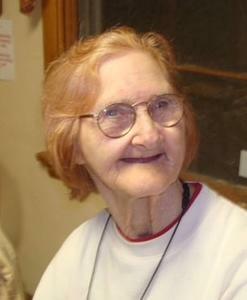 Helen attended First Congregational Church of Fruitport and participated at Life Circles. She would frequently ride her bike into Fruitport with her sister Shirley and shop in all the stores. Helen loved Elvis Presley and enjoyed reading the Chronicle and Woman's World Magazine, as well as coloring and drawing. Daughter, Patti "Tricia" Tezak; grandchildren, Holli & Kyle Tezak; great grandson, Malakyi; brother, Richard Beckhorn; sister, Shirley Cuddeback; nephew, Robert Cuddeback. She was preceded in death by her parents and brother, Ivan. Wednesday, May 23, 2018, 4:00 pm at First Congregational Church of Fruitport with Rev. Michael Scott officiating. Wednesday, One hour prior to the service at the church. MEMORIAL: Life Circle or the Church.